The fervent atmosphere at Atletico Madrid's Vicente Calderon stadium will make them hard to beat there in the Champions League, midfielder Koke says. The Spanish league leaders are into a first semi-final for 40 years after their 2-1 aggregate win over Barcelona. 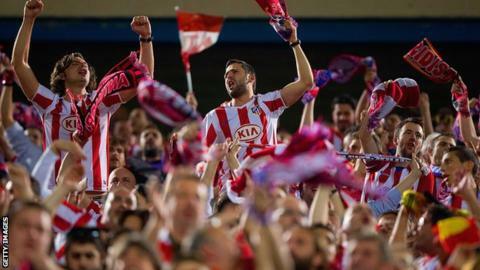 "With these fans behind us, it is very hard for us to lose a match here," said Koke, who scored after five minutes. Atletico's defeat by Real Madrid in the Copa del Rey is their only defeat at home so far this season. Barca coach Gerardo Martino also identified Atletico's home support among the 54,000 attendance for the second leg as crucial in his side's defeat - the first time the Catalan club have failed to reach the semi-finals since 2007. "This environment is difficult to find in Europe, but it's more common in Argentina," reflected Martino, whose side trail Atletico by a point in La Liga with six games remaining. Atletico coach Diego Simeone added: "The atmosphere was amazing. It didn't affect Barca because they are used to those atmospheres, but it did influence our players. It gave us great positive energy." The former Argentina midfielder, who also had two spells with Atletico as a player, praised his side's attitude over the course of the two legs, adding: "I admire the way they sacrifice themselves, the way they work for the team and never betray it. "That is priceless because in the history of all battles and all wars the best don't win but those who fight better strategically. And we try to be a bit like that."